A recent paper by Professor Glen Searle (UQ) and Professor Kevin O’Connor (UM) says Melbourne has performed better on a number of key metrics than Sydney since 2000. Sydney’s population grew by 10.8% between 2001 and 2011, but Melbourne’s grew by 17.6%. Sydney lost 249,000 persons by out-migration to other locations in Australia between 2001 and 2011 whereas Melbourne lost 41,000. Melbourne’s share of international air passengers, expressed as a proportion of Sydney’s, increased from 36.9% in 2000 to 55.1% in 2012. Employment grew faster over 2001-2011 in Melbourne than Sydney in some industries like pharmaceutical manufacturing (19.4% vs -6.1%), health insurance (82.7% vs 4.0%) and superannuation funds management (56.1% vs 7.1%). Sydney still remains dominant in aviation and international tourism and so it’s not surprising other cities are increasing share at its expense. Melbourne likewise continues to be dominant in containers and international students but also lost share. Professors Searle and O’Connor note that Sydney increased employment in some higher order services at the expense of Melbourne, notably in newspaper publishing, TV broadcasting and advertising services. However Melbourne performed better in telecommunications, market research services, management consulting, computer systems design and recruitment services. Melbourne lost more ground in manufacturing (and this will be reinforced by the headline losses this year). Yet the great bulk of jobs in any city are much the same because they service the local population; Melbourne’s key advantage over the period was its higher net population growth. The authors put a lot of weight on housing costs to explain the relative performance of the two cities, pointing out that an outer suburban (greenfield) house in Melbourne costs two thirds of one in Sydney. Victoria experienced a supply deficiency of 17,600 dwellings in relation to underlying demand between June 2001 and June 2010. But NSW’s deficiency over the same period was 73,700, indicating that housing construction in Sydney fell significantly short of population growth. As I’ve explained before, a 2010 study of dwelling costs by the National Housing Supply Council found it cost $561,000 to deliver a typical three bedroom house and land package on Sydney’s fringe. That’s considerably more than the $375,000 it cost in Melbourne. The difference is mainly down to Sydney’s constrained geography and high developer charges. 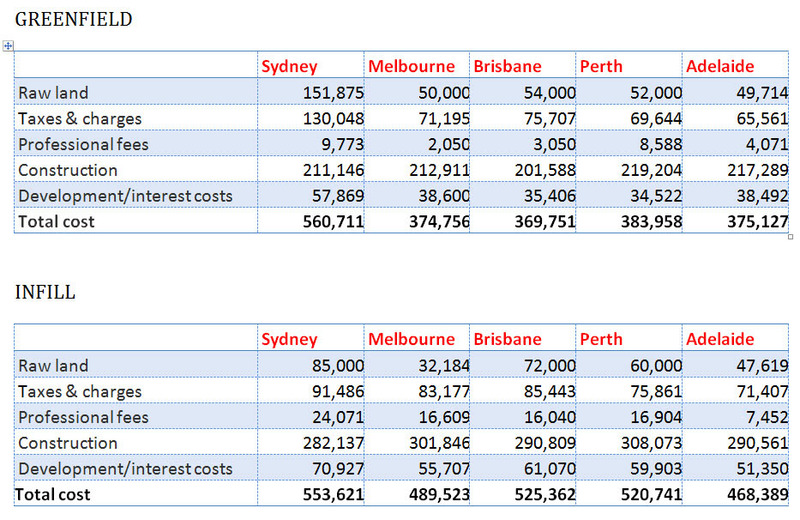 The cost of raw land in Sydney at the time was $152,000 per lot on average, compared to $50,000 in Melbourne. Further, developer contributions were almost $60,000 per lot lower in Melbourne. Although they don’t explore them, the authors speculate that Sydney’s complex planning rules, “relatively worse transport system”, and poorer investment attraction programs might also have contributed to its lesser performance over the period. More generally, it seems that Melbourne’s underlying geography is now starting to be an advantage in competition with Sydney. It’s less expensive and more easily developed urban fringe reduces land costs for housing, logistics and other uses. Melbourne airport’s location does not necessitate a curfew, unlike Sydney’s. The European quality of the built form of Melbourne’s central areas, such as its laneways and trams, has also captured the zeitgeist of Generation Y and helped make it Australia’s preferred destination for aspirational young professionals. These are all significant features that will keep Melbourne very competitive with Sydney. Although Sydney is clearly Australia’s global city, Melbourne also has formidable strengths. It regularly ranks in lists of top financial centres like Richard Florida’s Global Economic Power Index (although behind Sydney). It benefits enormously in terms of legacy institutions from having once been the country’s national capital (1901-1927) and at one time its major commercial centre. The fortunes of cities are primarily shaped by factors like geography, history and wider economic and structural changes. But they’re also shaped to an extent by factors within their control. Sydney suffered dysfunctional (state) government over much of the period considered here and depressed conditions in its global business sectors. All levels of government have also struggled with major infrastructure issues like a second Sydney airport. But Sydney can, and very likely will, do better. Sydney is the only city in Australia where the cost to provide an infill housing unit is the same on average as providing a greenfield unit; in the other capitals the latter is much cheaper. It’s likely this explains in part Sydney’s higher density.